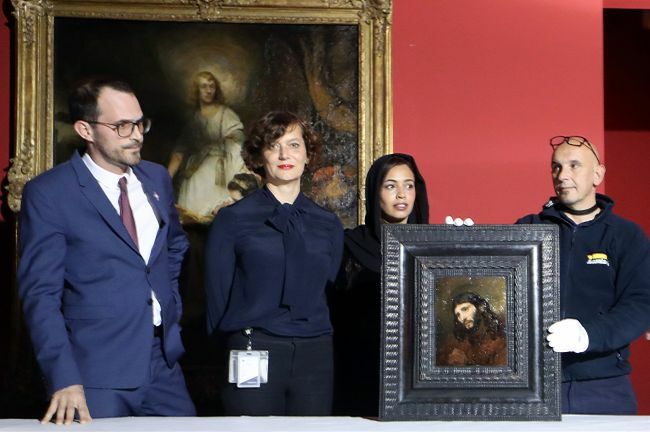 ABU DHABI -- The Louvre Abu Dhabi, the first museum to carry the famed name outside of France, announced Sunday it will roll out works by Dutch masters Rembrandt and Vermeer this month. Works by the two artists are part of the gallery‘s first exhibition this year, entitled “Rembrandt, Vermeer and the Dutch Golden Age: Masterpieces from The Leiden collection and the Musee du Louvre”. The exhibit, on display in the United Arab Emirates capital from February 14 to May 18, is dedicated to Rembrandt, Vermeer and the famed “fijnschilders” -- fine painters known for their detailed work -- of the Netherlands. The exhibition features 95 works, including Vermeer’s “Young Woman Seated at a Virginal” alongside Rembrandt‘s “Portrait of a Man” and “Study of the Head and Clasped Hands of a Young Man as Christ in Prayer”. The Louvre Abu Dhabi was inaugurated with great pomp in November 2017 -- nearly five years behind schedule -- by French President Emmanuel Macron and Abu Dhabi‘s Crown Prince Mohammed bin Zayed Al-Nahyan.